For its range of commercial cold and hot water high-pressure cleaners, Kärcher is introducing the ‘EASY!Force’ trigger gun in a brand new design. The main feature is the trigger, which is pushed into the handle with the ball of the hand. When the trigger is operated, the recoil of the water jet automatically presses the trigger into the hand, which contributes to effortless use. The reduced force action prevents hand and finger strain and in turn muscle cramps. Accidental operation is prevented by a yellow safety lever in the handle. This can be released again after briefly operating the trigger. 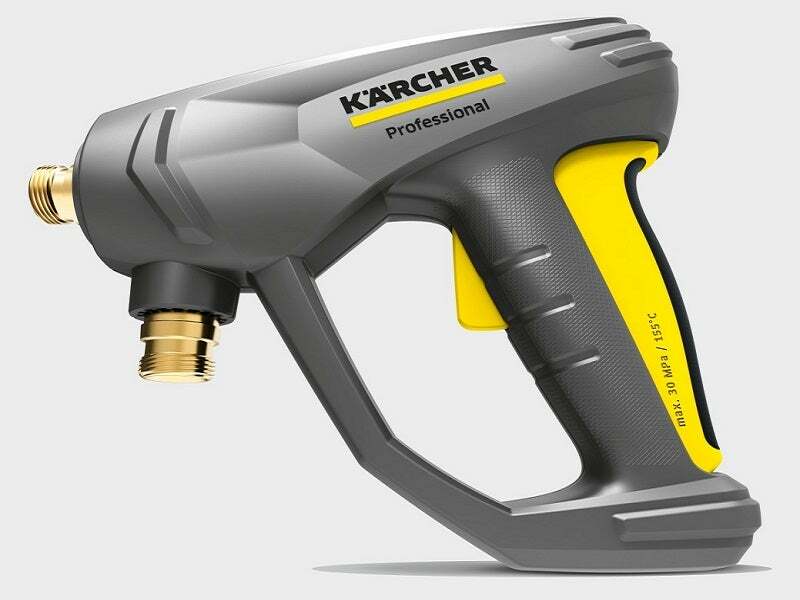 Kärcher has used this new trigger gun design as an opportunity to introduce further improvements. As a result, both interfaces from the trigger gun to the lance and high-pressure hose have been redesigned. A quadruple trapezoidal thread, ‘EASY!Lock’, allows a tight and reliable connection with only a single turn (360°). Further connections, from lance to nozzles and from hose to high-pressure cleaner, also feature the new ‘EASY!Lock’ thread. In this way, all components can be changed quickly and easily. A total of 476 accessory parts have been converted to the new screw thread. Thanks to special adaptors, the new trigger gun can also be connected to existing high-pressure cleaners. The adaptors can also be used to connect newly purchased high-pressure cleaners with the new thread to existing components. The valve has also been substantially improved, both main components, ball and valve seat, are now ceramic. This ensures a lasting and reliable seal. The ‘EASY!Force’ trigger gun is suitable for all Kärcher cold and hot water high-pressure cleaners with a maximum pressure of up to 300bar.